Replicator 1 X-Axis Cable Chain by GeraldO is licensed under the Creative Commons - Attribution license. The strain on the X-axis cables of the Replicator 1 has been documented to cause the endstop cable to break and potentially cause a fatal short, destroying the mightyboard. Having been through a few of these mightyboard blow outs, I've decided to design a set of cable chain mounts which house the X-axis cables on the Replicator 1. This cable chain upgrade provides you with a bracket which mounts to the stepper X-axis stepper motor and houses/protects both the stepper motor cable and the end stop cable in a cable chain. 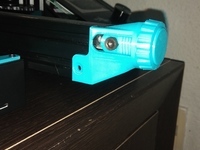 There is also a bracket which may be mounted anywhere inside the frame of the Replicator to tether the other end of the chain to the frame of the machine. Print desired number of cable links. I have a Replicator XL, and 30 links gave me plenty of slack in the chain. There is a plate of 24 links included as well as single links. Depending where you place the bottom end of the chain you may need more or less chain links, YMMV. You may also want to print a few extra just in case you discover your cable is too taught half-way through construction! Print both ends of the cable chain (cable_chain_end_bottom.stl and cable_chain_end_stepper.stl). It is recommended that these be printed at 0.2mm layer heights to ensure that everything lines up correctly. You may want to use full support structures for cable_chain_end_stepper if your printer cannot bridge very well. Depending on whether or not you have performed the XL upgrade, your cables may not be routed through the back right corner of your Replicator. For this mod to work, the stepper and endstop cables should be coming out of the machine from the back right corner of the bot. Feed both cables though your copy of cable_chain_end_bottom and begin assembling your cable chain by feeding the cable through, and snapping the links together one at a time. I assembled the chain first and fed the wires through later. This was a bit of a mistake as pushing the wires through after it was assembled was a real PITA! Pull your Y-axis all of the way to the front of the bot and continue to assemble the chain until the end comes up to the bottom of the stepper motor. There should be enough slack such that when the carriage moves to the extremes, the cable chain should never be pulled tight. Mark the spot on the inside of the frame where the holes are for the cable_chain_end_bottom part are. I made the vertical face of the bracket flush with the edge of the window but it is an entirely aesthetic choice. Put it where you wish! 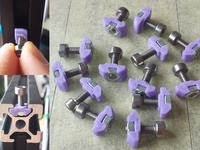 The provided holes are 4.5mm wide to accept slightly over sized bolts. Drill the holes through the frame using a 4mm drill bit (or whichever size your bolts are). OPTIONAL Now that your cable chain has been properly sized you may want to "break it in" by moving it around for a while. Depending on how tight the links fit this may not be an issue however, mine were extremely tight and required an hour or two of flexing before they moved freely. Having the chain flex freely will reduce the additional strain on the carriage's motion! If you've done this, reassemble the cable chain. Feed the endstop and stepper motor cables all the way through the channel in the bottom of cable_chain_end_stepper and snap it onto the end of your cable chain. Push your copy of cable_chain_end_stepper onto the bottom of the X-axis stepper carriage, it should fit snugly. The slots should line up with the slots on the carriage for the stepper motor screws. Sometimes the fit is tighter so you may need to push up a little harder to make it all line up. Take the washers from the M3x5 bolts you removed from the stepper mount and put them onto your M3x10 bolts. Screw in the M3x10 bolts into the stepper's holes to secure the bracket (and the stepper). 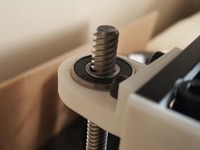 Use your 4-40x1/2" bolts to secure the other end of the cable chain to the frame of your Replicator. The heads of the bolts and washers should be on the outside of the frame (not necessary, just looks better imo) with the nuts going on the inside of the frame against the bracket and tighten. Now that everything is secured you should take the time to check the range of motion of your carriage. Move it from extreme to extreme in the Y-axis direction and check to see if anything is pulling or resisting its motion. If the cable gets too tight, you'll need to add a few links, hopefully you printed a few! If the cable feels sticky or resists motion you may want to remove it and flex it for a while to loosen it up. 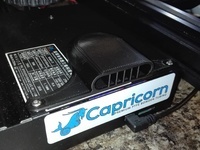 Once the cable looks and feels right, you can now connect the wires back to the endstop and stepper. Route the wires through the channel on the side of the carriage. Connect the endstop cable by passing it through the hole in the carriage. Connect the stepper motor by routing it around and down to the stepper motor connector. You're done! Enjoy your new, fancy looking cable chain! Say thanks by giving GeraldO a tip and help them continue to share amazing Things with the Thingiverse community. Say thanks and help GeraldO continue to share amazing Things with the Thingiverse community. You'll need a PayPal account to tip GeraldO. Click the button below and you will be redirected to PayPal. Once the payment is complete, you'll be brought back to Thingiverse.